Well made for outdoor use. Cushions are surprisingly durable. They are designed so they can be flipped if one side gets stained. 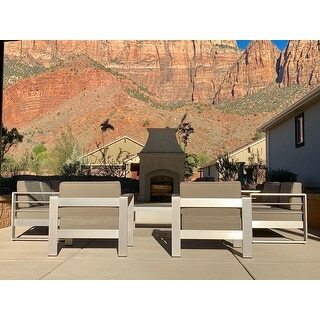 This Cape Coral set by Christopher Knight Home perfectly exudes a modern feel to any outdoor living space. With its unique and eye-catching design this set offers taste and functionality to your outdoor space. 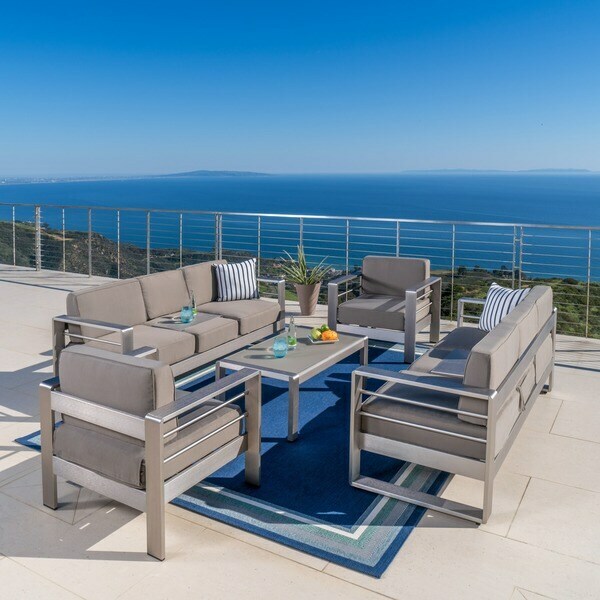 The combination of natural and industrial looking elements complements any style of decor and the aluminum and waterproof cushions make this set an immediate statement. Featuring enough seating for 6. Incredible set at an incredible price! I have been looking for the perfect sofa set for our outdoor entertaining space and this is it. Clean lines, contemporary flair, high-end look, and amazing value. The brushed-steel frame is beautiful and SOLID (an important aspect to me). Assembly took about 2 hours for one person (who didn't want to read the instructions haha). The pads that come with the set (some sets don't provide pads) are fairly thick and firm- made to last. Pads are also true to color. I took the photos of the set with "no frills" and no edits so you can see the actual colors. Once I finish accessorizing this area with pillows, rugs, and decor this will be a killer entertaining space. Perhaps my favorite purchase yet based on quality and value! This is a very nice set, if you like modern. The cushions didn't hold up too well, only lasted a year in Florida weather. So I would recommend scotch guard or something to protect the, . We purchased this set to put around our gas firepit. We also purchased a 15 and a 7 piece set along with bar stools. This 5 piece set was on backorder and as soon as I was emailed it was back in stock, I ordered it. It came in 3 days! It was easy to put together and our yard now looks like a 5 star resort! My husband is spraying a protective coating on all of the cushions so they will last longer in the AZ sun. 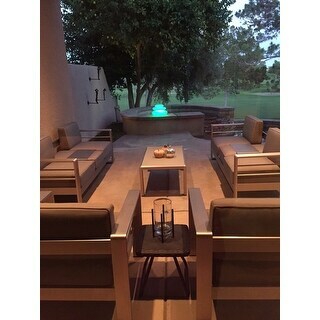 This Cape Coral contemporary outdoor furniture is well built and well worth the money! Beautiful outdoor patio set. The frames of the sofas and chairs were easy to assemble, lightweight and easy to move around but very strong and supportive. The cushions are well made, the fabric feels very durable. Overall this is a great set, very comfortable. It's tough to buy stuff like this online without actually seeing it and sitting on it but this was an awesome purchase, no regrets! 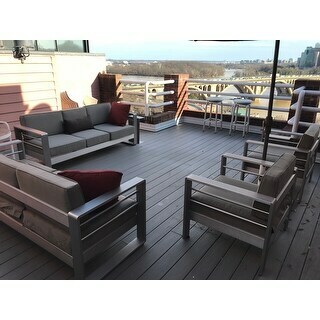 We absolutely love this aluminum 5 piece sofa set. It arrived fast and while we are not usually inclined to take on assembling such items, I convinced my husband we should give it a try. We were amazed how successful we were and in a reasonable amount of time. . . about 1.5 to 2 hours. It's absolutely stunning on our fourth floor deck. We do store the cushions in a storage cabinet, also on the deck, when not in use and hopefully this will add to the life of the set. I absolutely love this set. Not only was it well packaged, but it was super easy to assemble. It probably took me 1 hour to complete all 5 pieces, and it only took that long, because I took a few breaks to sit on the furniture and admire it!! 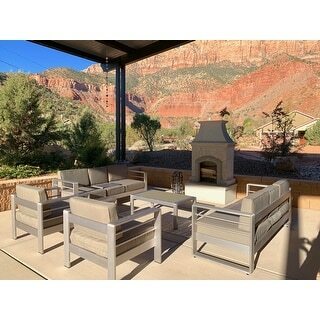 I highly recommend this to anyone looking for a well-built as well beautiful patio set. The seat cushions are a taupe-grey color and the aluminum looks like brushed nickel. This set looks great! It was easy to assemble. It's durable. Perhaps the only drawback would be there was only the one color for the cushions when we purchased the set. My wife thinks the cushions are a little hard whereas I think they are fine. We did have a small issue with the glass on the table, but Overstock customer service was fantastic in getting us out a replacement right away. Very good quality for a lot of furniture at an amazing price! My husband assembled this on his own, in about 3hrs & said it was very easy. It’s a substantial aluminum, not flimsy whatsoever. I loved the firmness of the cushions, no tacky sinking in feeling. I can finally invite my friends & family over and feel good about how my patio looks! I highly recommend. This furniture is the highest quality and provides the incredible modern look we wanted. Perfect for Florida weather with the aluminum frames. Extremely easy to put together. We would recommend this to everyone! These pieces are wonderful. I love them. Love this set. Came very well packaged, not a scratch on it. Comfortable, stylish, well-built, it should last many years. Even my wife who I surprised loved the set. It also look very easy to assemble. My wife and I assembled the whole thing in a couple of hours. Now I'm looking for a matching fire pit and I'm good to go. Thanks Over Stock! great set. This is the second time I'm purchasing the set because we loved it and can't find replacement cushions as they do fade in the sun after a couple of years. One of the pieces came incorrectly screwed couldn't put together because of it . You would wonder if they check everything before going out the door so these kind of problems won't happen . I will call customer service and see how long it will take to get a new shipped this is not what I wanted to deal with for the first time shopping here . I do want to express how nice the other pieces are I love the set just wish I wouldn't have to deal with this problem . These were easy to put together (my husband did it all without my help), and they look beautiful out on our new patio. They perhaps are a bit lower to the ground than you can see in the photos, but we’re ok with that. The cushions are thick and firm. It was a pleasant bonus to get the little trays that can be used to put your drinks on when the middle cushion of the sofas isn’t being sat on— we saw it in photos, but I didn’t read that it was included. Love the set. Easy to assemble. Shipped fast, good quality. Highly recommended. "Is this set All-season? I know the cushions would have to come indoors, but will it survive in Midwest winter outside? " The item is not weather resistant, therefore we do recommend that the items be stored away when not in use to help increase its longevity. "what is the seating height for the love seats and for the side chairs: what is the distance from the ground to the top of the seat cushions?" The seat height is 15.5 inches. "Just got this set. Hubs is putting it together today. So, here's my question - can THREE people safely sit on ONE couch? with 3 back cushions across I'd assume so but hubs says that since there's no support in the middle and b/c it has the funky flat piece for drinks that can be used to cover the middle cushion it's only a TWO seat couch which seems crazy to me. I mean why would you have cushions on a couch if they can't be sat on? Please advise. Anyone have this and safely had 3 people sit on it w/out issue?" Yes, it can fit 3 average sized adults. The u-shaped board in the middle can be removed. "What color is the cushions?" "will the sofa fabric fade overtime? are they sunbrella"
It is not Sunbrella, and may fade over time. Modern. Right pieces! Love the look.